SDSC Annual Report 2017/18 is a publication presenting SDSC's leading-edge research in data cyberinfrastructure and computational science for FY2017/18. UC San Diego CyberLink (sample - subscribe) is a monthly e-publication -- jointly published by SDSC, Calit2, the Jacob School of Engineering, and the UC San Diego Library, in collaboration with Administrative Computing & Telecommunications (ACT) -- describing the latest cyberinfrastructure news and events at UC San Diego. SDSC Annual Report 2016/17 is a publication presenting SDSC's leading-edge research in data cyberinfrastructure and computational science for 2016/17. SDSC Annual Report 2015/16 is a publication presenting SDSC's leading-edge research in data cyberinfrastructure and computational science for 2015/16. SDSC Annual Report 2014/15 is a publication presenting SDSC's leading-edge research in data cyberinfrastructure and computational science for 2014/15. 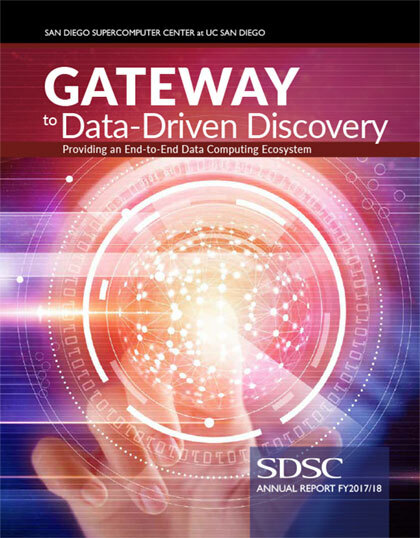 SDSC Annual Report 2013 is a publication presenting SDSC's leading-edge research in data cyberinfrastructure and computational science for 2013. SDSC Annual Report 2012 is a publication presenting SDSC's leading-edge research in data cyberinfrastructure and computational science for 2012. SDSC Research Advances is a publication presenting SDSC's leading-edge research in data cyberinfrastructure and computational science. EnVision magazine presents leading-edge research in cyberinfrastructure and computational science at SDSC. Cyberinfrastructure Technology Watch Quarterly (CTWatch Quarterly)> an online venue designed to engage the science and engineering research community in the news, ideas, and information surrounding the emergence of cyberinfrastructure as the essential foundation for advanced scientific inquiry. Women in Science is a publication containing brief bios for sixteen women who made significant contibutions to science throughout the ages. Workshop on Cyberinfrastructure for the Social and Behavioral Science is the final report from the NSF-funded SBE/CISE Workshop intended to help identify the SBE sciences' needs for infrastructure, their potential for helping CISE develop this infrastructure for engineering and all the sciences, and their capacity for assessing the societal impacts of Cyberinfrastructure.